Whatever possessed me to try this? And then, whatever possessed me to try this 3 times? And worse, whatever will possess me to try this one more time? I suppose the answer to the possession questions above is, I grew up in an Italian neighborhood. We could walk a half block to a little Italian grocery store and buy fresh Italian bread that was baked on the premise that morning. It was good. Add 1 cup of flour to a mixing bowl. Mix in the packet of dry yeast. In another small bowl stir together the water, sugar, salt and oil. Heat in the microwave 45 seconds to a minute to reach 130 degrees F. Stir to dissolve the sugar and salt. See notes below. Add the warm water mixture to the flour and yeast. Mix either by hand, with a fork, or with a mixer until the lumps are gone and the mixture is smooth. About 3 minutes will do. Add another cup of flour. Mix again for another minute until all the additional flour is blended in and there are no dry patches of flour. If hand mixing, the fork has most likely met its match at this point. So don’t be afraid to dive in with your hands to do the final mixing. It’s a little sticky, but with some washing after, you’ll survive. We’re not kneading the dough, so don’t over mix. Cover the bowl with some plastic wrap and let rise in a warm place for about 15 to 20 minutes. The dough should just about double in this amount of time. See notes below. Now we’re kneading. Spread about 1/4 cup of flour on your counter or board. Knead the dough for about 8 minutes. As you knead, the dough will have moments when it gets a little moist and sticky. When that happens roll the dough in the flour on the board to pick up more flour. That will dry out the wet sticky places in the dough. Sprinkle additional flour on the board as needed. You should end up with a nice ball of dough that doesn’t stick to your hands or the counter. Somewhere between 1/4 and 1/2 cup of additional flour should be about right when it’s all over. Put a little bit of oil in a clean mixing bowl. Place the dough ball in the bowl and roll in the oil to coat the dough and the inside of the bowl with the oil. Cover and let rise in a warm place for about 15 to 20 minutes. The dough should just about double in this amount of time. Finally! Sprinkle a little flour on your board. Divide the dough into two equal pieces. With a rolling-pin, roll one piece of dough into about an 8 inch by 10 inch rectangle. Start on the long side of the rectangle and roll the dough up into a cylinder shape. Pinch the other side of the dough to the roll so there’s no open seam. Take the edge of your hands and press down on the very ends of the roll to flatten and seal the ends. Fold the flattened ends under the loaf. If things are going right, the dough will be slightly rising and actually resisting your efforts. Be tough. Lightly oil a baking sheet. Sprinkle some corn meal on the sheet if you have any. Place the loaves on the baking sheet, seam side down. Repeat this with the second piece of dough. Make some shallow diagonal decorative cuts on the top of each loaf. Brush the loaves with oil. Loosely cover the loaves with some plastic wrap and let rise in a warm place for about 15 to 20 minutes. You’ll know when the dough has risen enough by gently pressing the dough in one spot with your finger. If the indentation from your finger stays down, the dough has risen enough. Other than the finger thing, don’t do anything else to the loaves at this point. Be gentle. They’re full of air and if provoked too much will fall back down. Remove the plastic wrap. Place in a preheated 425 degree oven for about 20 to 25 minutes until nicely browned. 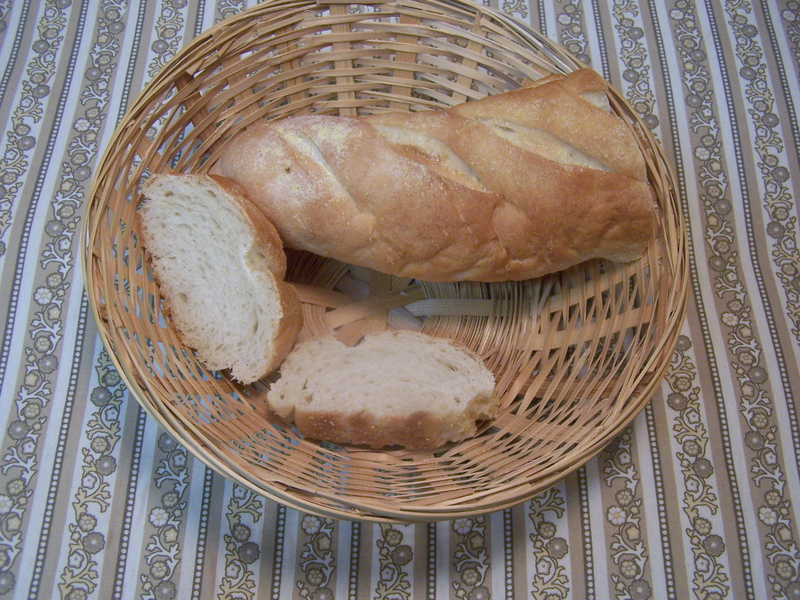 There are about two ways to use yeast in baking. If you read enough yeast packages or search enough web sites, you’d think there are about 100 different methods. Here’s what I think it all boils down to. For method one, my recommendation, mix the yeast with the first portion of dry flour. Heat whatever liquid the recipe calls for to 130 degrees F. (a quick trip in the microwave will do fine). Use a thermometer, if you have one, to get the liquid temperature right. Regardless, make sure it’s more warm than hot liquid. Hot will kill the yeast. That’s a bad thing. When you feel you have the right temperature, add the liquid to the flour/yeast in the other bowl. For method two, stir the yeast into the liquid at 110 degrees F. Then add the liquid to the flour. Use a thermometer if you have one. Otherwise 110 degrees F is barely warmer than you are. Make sure the water is that way. However this is messier than method 1 and probably easier to screw up if you don’t have a thermometer. So just do method 1 unless the recipe really cares about using this method. Rapid rise or regular yeast? I don’t know. If the rapid rise really does anything, using it should cut down the rising time. It actually seems to have worked that way for me. Most recipes call for 45 to 60 minutes rising time. This recipe rises just fine in 15 to 20 minutes using my warm(er) place. So let’s use rapid rise. I’m going to recommend Red Star yeast. This is only because I used a competitor’s yeast and failed twice with it. That was due to incomplete information on the package and a bad recipe they published. However I’m sure just about any yeast is going to work with the proper instructions. Red Star had pretty clear instructions. Hopefully I haven’t contradicted them too much here. What’s a warm place? Most likely your home room temperature is about as warm as you need. A warm place for yeast is considered about 80 degrees F. I actually put my oven on preheat for about 45 seconds and placed the covered bowl in there to rise. To make sure it wasn’t too hot, I felt the air temperature in the oven with my hand (don’t touch the metal in the oven). 80 degrees is just barely warm. Since I had a good rise in about 15 to 20 minutes, this didn’t seem to hurt anything. To be honest, the reason why I’ll be doing this a 4th time is, I didn’t nail down the baking time. 20 to 25 minutes is the right time range. But I can’t tell you the exact time that makes it just perfect. This entry was posted on 12/09/2010 at 10:00 and is filed under Recipes, Recipes, food, cooking and related items, Vegetarian. You can follow any responses to this entry through the RSS 2.0 feed. You can leave a response, or trackback from your own site.